I just wanted to send you an e-mail to pass on my thanks for the welfare parcels that you have sent out to me and the other guys here on Op Kipion in the Middle East. I am now coming to the end of a six month deployment in the Middle East. It is sometimes difficult being away from home in an often arduous environment. I know i can speak for everyone when i say how very appreciated your parcels are. That contact with home and the gifts within the parcels are guaranteed to cheer everyone up. I know they have me. So please pass on my thanks to everyone and thank you all for doing what you do, you are very special people and your thoughts mean a lot to us all. I hope you are well!, I must start by thanking you for sending out a parcel to us whilst deployed on operations. Your parcel was sent to the medical officer in my location and shared between the medical team.So it brought joy to many of us in the team. The food items we have shared and several items people have required so came at the perfect time. The lip balm was most needed for myself due to the heat my lips have sadly gone very dry, so thank you for that,and again thank you for everything in the box. Things like this remind you that there are such thoughtful and kind people, that support us. A little about myself, my name is Georgina and I am a combat medic in the Army. I have been in nearly six years and this is my first operational tour. I really enjoy my job and the army, and the great things it has allowed me to do. I am off home in august for two weeks and this means I will make my Best friends wedding so I am currently over the moon with happiness. I hope the rain that the UK has recently experienced has reached your part of the UK and hopefully your grass will be green again, but if not then I’m sure your husbands make shift sprinkler will last the summer and at least we can say that the UK has experienced and proper summer this year. I hope you and your family have a lovely summer and rest of the year, and its such a kind thing that you do. We are off home from our tour in December hopefully in time for christmas. I hope you have a lovely christmas, and thank you again. Thank you very much for taking the time and effort to put together these fantastic welfare packages. Their arrival at our small team’s location created a stir of excitement. All the items have found great homes and a smile was brought to all our faces with the more frivolous but fun addition of party water balloons. Unexpected but will be put to a creative morale use! We were able to see the RAF 100 celebrations on a video feed and despite the small screen it was obvious to all that this was an event the Royal family and public were proud of and wanted to be a part of; tens of thousands of them. While it is the RAF’s year it does keep all the force’s quiet diligent work around the world in their minds at least for a bit. I do hope that your daughter’s husband is safe and well, but if he is deployed that your daughter is able to keep in touch. The heat in the UK sounds oppressive especially for the very young or old given the natural humidity of the UK. We really aren’t set up for even marginal extremes of temperature/ rain/ wind etc. Although it does give the tabloids a chance to run a pithy headline pun or two. Certain experiences in your life stay in your memory and my times travelling around the UK and abroad using Youth Hostels are one of them. Great times and some great conversations. I am emailing to express my gratitude, and that of the military personnel that work alongside me, for the morale boxes that have arrived today. The reminders of home brought smiles to our faces, and we cannot thank you enough for your efforts and support of those who deploy and are deployed. Please know that your efforts, and those who raise money for SoS, truly motivate us to stay focused and do the job that we are asked to do. Today I received a wonderful box of treats from Virginia. I signed myself, the Flt Lt and the big boss (who doesn’t get much mail) up a month ago and we are all absolutely amazed by what goes into these boxes. I had sweets, Can of Iron Bru, crisps, some well needed hair therapy mask sachets & Body lotions, tea bags(…which are like gold dust out here for proper ones that are not made by Lipton). I loved the fact that inside my parcel, was a short letter from Virginia explaining a little about herself and would love it if you could send on my sincere thanks for the box she packed. In her letter she mentioned that she plays in a steel drum band and also sings in a rock choir. I too enjoy music as a hobby, in fact since deploying to *******, I have been the lead singer in a Rock Band us Brits have put together called Dirty Dieds so I find her letter even more poignant that it was me chosen to receive her box. Anyway, I just wanted to express my sincere thanks for all that you and your team do. It is really appreciated. Just emailing to say thank you very much for the parcel! The peanuts in particular have gone down a treat! I hope you have / have had a nice Birthday and your friends and family spoil / spoilt you. I just wanted to thank you very much for the box you sent out to me this week and wondered if you could pass on my gratitude to Carol for packing it and for her letter. She has recently been away on a break to Bath and I too took a break to Bath last year just before I deployed for 6 months so it was nice that someone else liked it as much as I did, although it sounds like I had better weather! The items in my box were so useful and I am extremely grateful for the service you provide, please keep it up because it means so much to receive mail whilst away from your family, friends and home life. I just wanted to express our thanks for the boxes we just received. It’s quite funny to see the lads diving in for different products that are hard to come by or just a welcome site after months away. One all-star favourites were the pork scratchings! 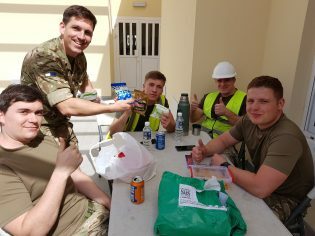 The picture is a few lads from my team taking a welcome rest form the sun and sharing one of the boxes out. Thanks again, take care and god bless! My name is T*** and I am the head chef on board HMS CHIDDINGFOLD. We are a mine hunter with a crew of 46. I am writing to you to thank you for the “Shoe box of Love” we received today. The boxes are very much appreciated at any time as it’s like receiving a little piece of home, at times when we are in a dark place. We are 6 weeks into our 7 month deployment and get back to the UK in September. Please keep the boxes coming as they are very very much appreciated. It’s really pleasing to hear your dog is on the mend of which will be a relief to you I’m sure. If I could be so bold to ask you for anything that we miss it would be ground coffee. Can I thank you one last time to you and your group for all the support you give to the forces in and out of operational theatre. On behalf of the ships company and specifically the senior rates mess I will you all the very best. Thank you so much for the parcel you sent to the Joint Operations Centre in the Falklands. We really appreciate the effort you went to putting it together. Sitting here having eaten most of the packet of fruit gums I feel I should write you a quick note to express my personal thanks. All of us our counting ourselves quite lucky as we are here during the Falklands summer. I should be back just in time for the UK summer! There are a lot of benefits to being down here, I have long since lost count of the number of penguins I have seen and there is plenty of other wildlife as well. Please pass on my thanks to everyone at Littlehampton Support our Soldiers. I grew up in West Sussex and my parents still have an Optician in Steyning. It is nice to get a parcel from near home. Trevor and you have a lot of military family history. I was fortunate to visit Italy last year with the Army and having seen some of the battlefields I have a great respect for your fathers’ generation. It must be an interesting story as to how Trevor’s Grandfather, a South African, was awarded an American medal for valour. Thank you again for the parcel. Penny, it is with great pleasure I email you today to thank you and your Branch of SOS for your generosity, I received my Happy New Year box this morning and as I look through my office window I can see my juniors getting tucked in to all types of goodies which is fantastic; I have cleverly removed all the nice smelling goodies for myself!! As you know 6 months away from home is tuff even on us who are senior, especially when it’s over a Christmas and New Year period. The highlight is always the incoming mail run and to receive a parcel makes it extra special. You do a fantastic job back in the UK fund raising which is very much appreciated by us all serving all over the world, without people like yourself and your team we as Servicemen would feel isolated, once again a very many thanks to you all. 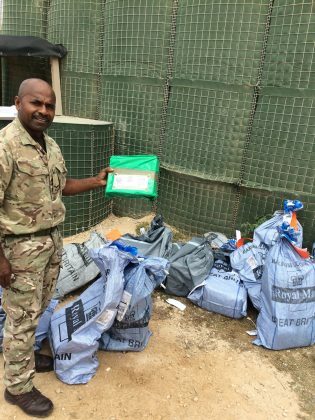 Thank you very much for the parcels you have sent out to myself and the other British soldiers deployed on various Operations out here in Somalia. Your dog Louis sounds like a bundle of energy, i have a 3 year old Dalmatian called Duke back home. I will try and get a picture of myself and some of the lads with there parcels for your website or just so you can see them being enjoyed. Thank you again, Support our Soldiers and your own personal efforts make a great difference to our comfort and morale out here. Everyone knows the green parcels are the good ones. I hope you are doing well back in UK. It is very great to see you recognised the job we do out here. Your support is highly appreciated. It is every UK citizens responsibility to make our Country a safe place and providing this support to us means you are part of making our Country a safe place. You would not imagine the amount of morale the parcels you send brings within the teams we operate. The mood is like you’re there opening your Birthday present and you just find out your Parents have brought you your first car. Please continue the good Job. I write to thank you for the parcels you sent via SOS and to let you know it successfully reached Kabul and the Officers and Soldiers at ISAF headquarters. It is very much appreciated to know that people at home realize that we are still here and are thinking of us at Christmas. It is always hard to be away from family, but Christmas is particularly difficult. If this arrives with an English postmark it is because I asked a Soldier going home on R & R to post it. Once again thank you. Your parcels hit the mark in terms of being both practical and with a few treats. Happy New Year and all the best for 2015. I’m the soldier who received your parcel at Christmas and just wanted to say thank you very much for sending such a nice parcel. It was great to be able to get a Christmas parcel while I was away in the Falklands for Christmas. I hope you had a great Christmas and a Happy New Year. and I am a Royal Marine based on our nations flagship HMS Bulwark, my specific job is a crewman on a landing craft. Your package was by far the best out of everyone elses, all the lads were so jealous of me! It really made my Christmas day enjoyable, I hope yours was good too. P.S. I have enclosed a patch from my unit. Our deepest thanks to you and everyone who sent us this parcel. On opening this box there was some big smiles on the lads faces and shortly after, many full belly’s. Here is a little rhyme to show our appreciation. help us move fast and stay low. I have been trying to send you photos of us in Christmas Jumpers as promised!! Thank you for all the parcels you sent to me and the lads. They all arrived in time for the festivities and were very well received. You support and a touch of home was brilliant during our six months away, we can not thank you enough. Thank you Carol for your box and more so for your letter. it made a real difference! 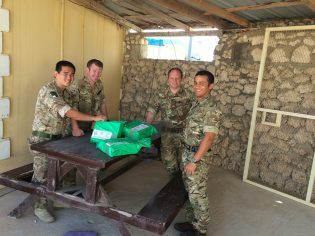 Thank you very much for the parcels you have sent out to myself and the other British soldiers deployed out here in Somalia.The pork scratching’s are the best for me went down a treat. Anyway, I just wanted to say thanks for all that you and your team do. It is really appreciated.